Posted: Wednesday 19th November 2014 in Paid Media, Thought Leadership. What are the best keywords for selling Christmas rees? What worked well for you last year? Look back to the top performing categories and products, how did you maximise performance in these areas? Where should you focus your budgets and when this year? and what didn’t… should you have phased your budgets differently, focussed on different areas at different times? But don’t forget, things have changed… Mobile will play a leading role (see more on this below). A different device mix, PLA growth, changing competitors and differing budgets are all factors you must consider when preparing for peak 2014. Google advised that 27% of all online sales came through a mobile device last year and they are expecting it to be even bigger this year. Rumour has it that mobile is likely to own up to 34% of sales in 2014. There are even suggestions that mobile will surpass desktop numbers on Christmas Day! 44% of retail queries came from mobile devices in December 2013 leading to over £3bn sales, it is therefore crucial that we are ready for the mobile bonanza this peak. The peak online Christmas shopping day is predicted to be December 1st (what’s now known as Cyber-Monday) with a projected UK spend of £281 million. – Promote your USPs loud and clear – in 2013 consumer confidence in online shopping soared thanks to the growing popularity of Click & Collect as a service. With 25% of multichannel retailer sales coming through Click & Collect last year it is essential that you shout about it! 4. RLSA campaigns – don’t be the Christmas Grinch! Improve the efficiency of your targeting by showing your ads to more customers who have already shown an interest in your site, products or offerings. Moving into peak up-selling is key. Target potential customers with complimentary gifts and products increasing the likelihood of an improvement in CTR and conversion rate. Take a look at our blog Christmas Display Retargeting Campaigns – Don’t Become the Christmas Grinch! for tips on effective retargeting that doesn’t annoy your customers. Bing & Yahoo! have higher average order values than Google with over 47% of their demographic earning more than £30k per annum. Based on last year’s data Bing and Yahoo! expect retail click volume to grow by up to 28% in comparison to 2013 whilst also expecting Cost Per Clicks to remain 30% cheaper than Google. Yahoo! and Bing are expecting another year of peak growth, predicting that their online sales will reach over 28.5% in 2014! 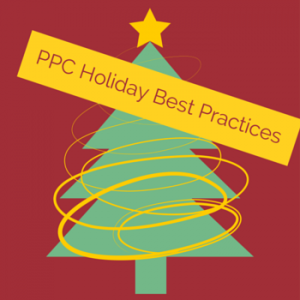 So there you have it – Summit’s recipe for a Very Merry PPC Christmas. If you’d like to know more about how we can help you get the most from your PPC campaigns contact David Trolle or call 01482 876 876.